Coats are typically worn for warmth but a great coat can make a profound fashion statement. Use this illustrated guide to understand the various components that make up a coat and jacket and the many jacket/coat styles available to choose from. 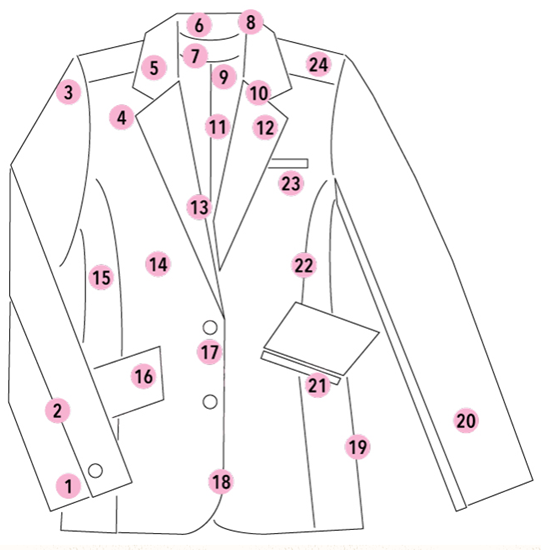 The measurement of jacket/coat lengths and sizes refer to body landmarks such as the waist, hop, and thumb. 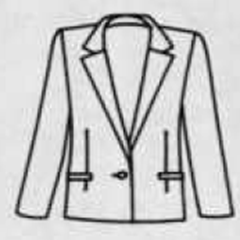 The apparel industry uses center back length measurements in inches from the base of the neck to the hem. 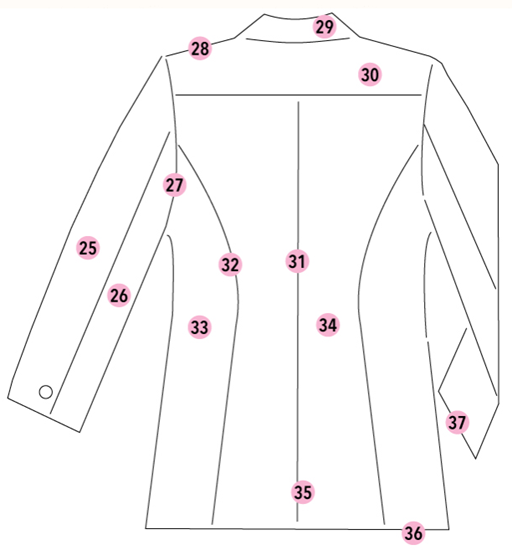 The approximate landmarks for a size 10 are listed below. 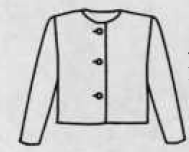 A bolero is a very short, waist length or above the waist jacket that is collarless and buttonless. It may be long- or short-sleeved or even sleeveless. 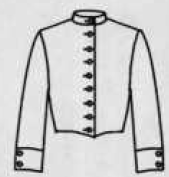 Variations with long sleeves, epaulets, and braid trim are called a toreador. 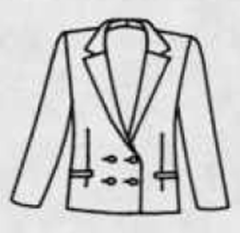 A box jacket is a straight unfitted jacket that is waist length or longer. 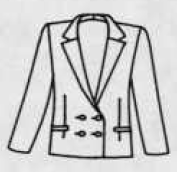 A box jacket may or may not have a collar. A Chanel jacket is a waist length or slightly longer, unfitted, collarless jacket. 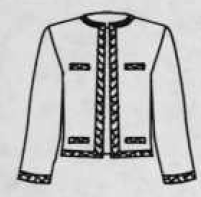 The edge of a Chanel jacket is usually trimmed with braid. 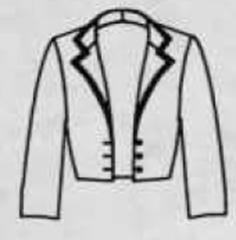 A fly-away jacket is a jacket where both back and sides of the jacket have been given exaggerated flare or fullness. May also be referred to as a trapeze jacket. 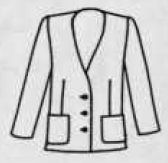 A single-breasted jacket is a conventional center front closing jacket with a single button or several buttons. 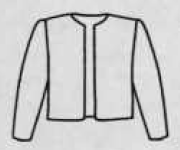 A double-breasted jacket is a front closing jacket with a wide overlap. 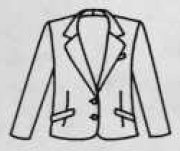 When closed, a double row of buttons are visible (although only one set may actually function while the other is merely decorative). 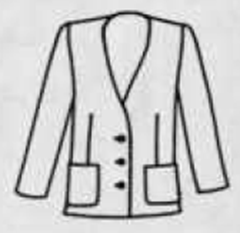 A cardigan is a collarless jacket of any length with front button closures. 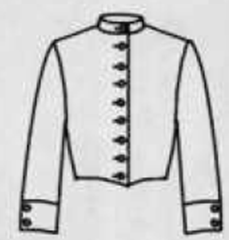 The neckline may be round or V-shaped. 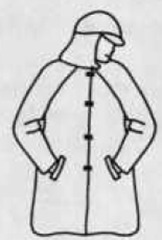 A chubby is a waist or high-hip-length coat with heavily padded shoulders and sleeves the same length as the coat. Chubby jackets are usually made of fur or a pile fabric to give it a bulky look. 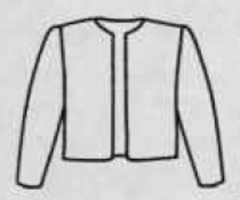 A baseball jacket is a waist-length jacket with a knitted collar, cuffs, and waist finish with large snap-front closures. 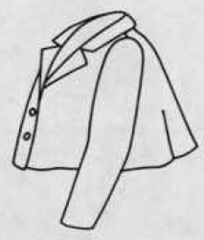 A bell boy jacket is a waist-length, fitted jacket, with a stand up collar. They are typically trimmed with brass buttons. A Chinese jacket is a hip-length, straight jacket with a band collar and a side front closing. 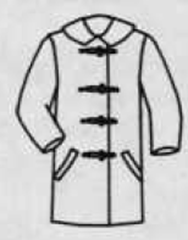 They are also called Mao or coolie coats. 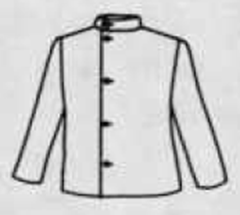 A Nehru is a hip-length, slightly fitted jacket with a band collar. they are buttoned at the center front and sometimes referred to as rajah or mandarin jackets. A Tyrolean is a waist to hip-length jacket with a band collar. They may have wide lapels and are usually closed with decorative buttons. 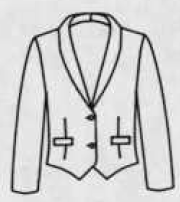 A battle jacket is a slightly below waist-length jacket with a fitted waistband and notched collar. They usually have patch pockets with flaps. May also be referred to as a Eisenhower jacket. 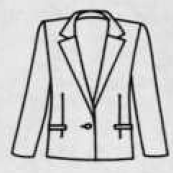 A blazer is a classic jacket that is semi-fitted, single-breasted with two or three buttons, three patch or slash pockets, and a notched collar. 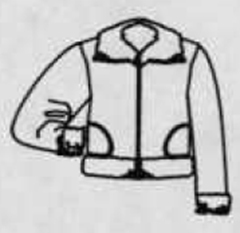 A bomber jacket is a slightly below waist-length jacket with inseam pockets adapted from U.S. Air Force pilot jackets. 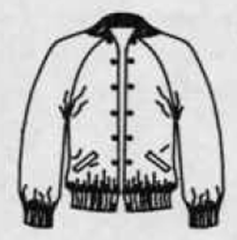 The original jackets were leather with sheepskin lining. 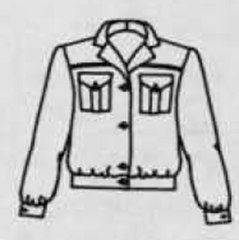 They are also called flight jackets. 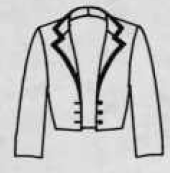 An eton is a waist to hip length straight-cut or semi-fitted jacket with high stand notched collar and wide lapels worn unbuttoned or with only the top button closed. An insulated jacket is a jacket of closely woven out fabric, filled with down or fiberfill, and usually closed with a zipper covered by a storm flap. 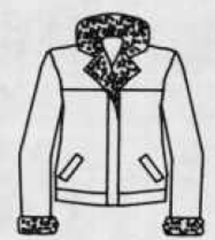 The lining and insulation may be quilted or out fabric and lining may be quilted to hold insulation in place. It is considered a type of parka or ski jacket. A norfolk jacket is a hip-length jacket with two box pleats stitched from the shoulder to the hem, except for a slot at the waist through which the matching belt is threaded. They may have hip level patch pockets. 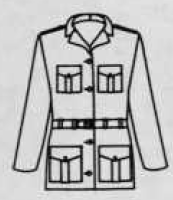 A safari jacket is a single-breasted hip-length style with bellows pockets on the chest and hips and a fabric belt. They are also called bush jackets. 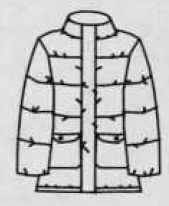 A parka is a waist or hip length jacket of windproof, water repellent fabric, usually insulated. It may have an attached hood. They are also called ski jackets. 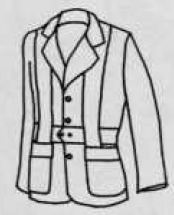 A pea jacked is a double-breasted hip-length jacket with large buttons (usually metal), vertical slash pockets, wide high stand collar, and wide lapels. The traditional color is navy blue but brown and camel colors are common. 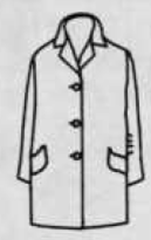 They are also called pea coats or pilot coats. A shearling is a jacket in a variety of shapes made from sheepskin tanned with the wool attached and sewn with the wool on the inside. They may also be made from manufactured fleece. 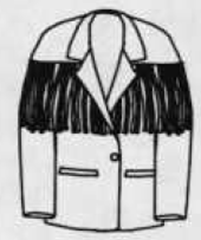 A western jacket is a waist- to hip-length jacket with yoke and breast pockets. 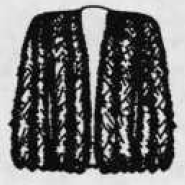 They sometimes have fringed leather hanging from the yoke, sleeves, and hem. 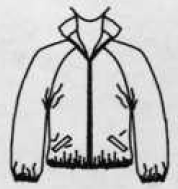 A windbreaker is a lightweight, waist-length jacket with elasticized cuffs and waistband, high stand collar, and zipper or large snap-front closings. A mackinaw is a double-breasted, shawl or high stand collar, belted hip length jacket of blanket-like wool fabric with a striped or plaid design. 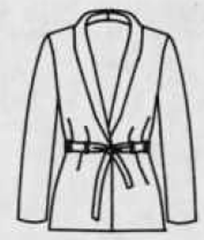 A smoking jacket is a shawl-collared, buttonless wrap jacket fastened with a soft fabric tie belt. A spencer jacket is a waist-length, single-breasted jacket with a shawl collar. 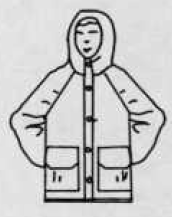 An anorak is a pull-over jacket, typically with an attached hood. 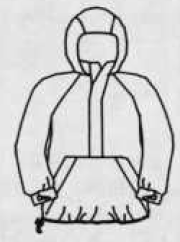 The front neck opening may be closed with zipper or snaps. 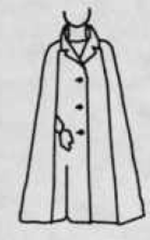 A cape is a sleeveless outer garment with a front opening, usually cut in a geometric shape such as a rectangle, circle, or oval. 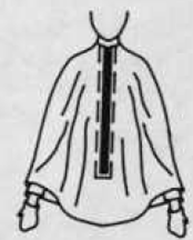 They sometimes have slits for armholes. A poncho is a geometrically (rectangular or oval) shaped piece of fabric with an opening cut for the head, It may have a front neck opening and pockets. 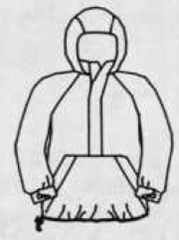 A stole is a rectangle or triangle of fabric that is wrapped around the body. 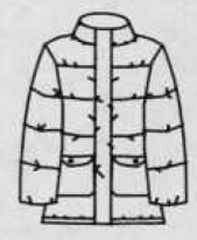 A duffle coat is a three-quarter length coat usually with an attached hood and wooden fasteners or metal toggles. They are also referred to as a toggle coat. 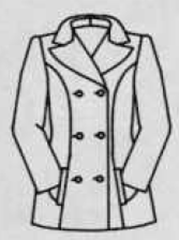 A pant coat is a thigh length coat in a sporty style. They are also called car, stadium, or suburban coats. 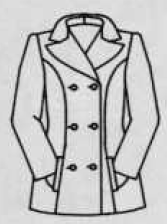 A coachman coat is a coat fitted to the waistline with a flared hem line, double-breasted, wide, high-stand collar and wide lapels and brass buttons. 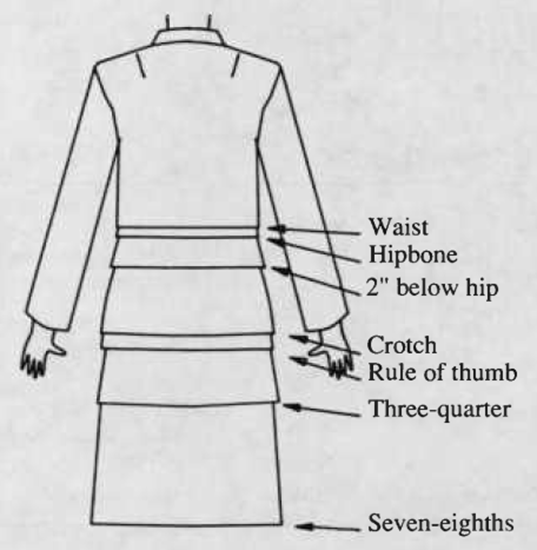 A princess coat is fitted to the waist with long seams from the armhole to the shoulders, no waistline seam, and flared hemline. They usually are single-breasted with a low stand collar. A chesterfield is a semi-fitted, single or double-breasted front, high stand collar coat with wide lapels usually in velvet. May have a fly front or concealed closing. 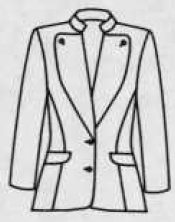 A reefer is double-breasted coat with a wide collar and lapels that is fitted at the waist with long seams from the shoulders to the armhole to hem, and a flared hemline. 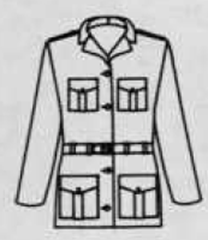 A trench coat is a sturdy raincoat of water repellent fabric, which is usually double-breasted, has a high stand collar with large lapels, loose shoulder yoke, epaulets, slash pockets, and a belt with buckle. A wrap coat is a straight coat without buttons, held with a tie belt. They are usually double-breasted to allow for adequate overlap. A balmacaan coat is a loose-fitting coat with raglan sleeves and small convertible collar. 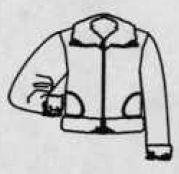 A fly front may be used to conceal buttons. 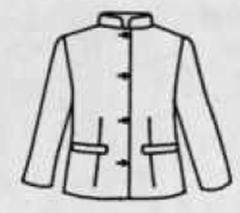 A polo coat is a boxy straight coat, single or double-breasted, with large buttons, optional sash belt or half belt, and a high stand collar. They are usually camel colored. 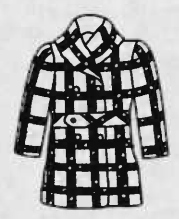 A slicker is a boxy coat made of brightly colored waterproof vinyl. They frequently have metal clip fasteners and may have an attached or separate hood. 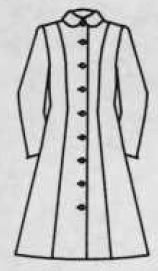 A tent coat is a shaped coat, narrow at the shoulders and very flared at the hem. They are also called swing, swagger, or pyramid coats.